Let’s face it: there is just something about a Vespa. Though I am by no means a brand snob, there is something about the iconic Italian scooter that feels authentically cool. Maybe I love all things European. Or perhaps I have been seduced by decades of marketing that tell me the Vespa is the scooter of choice. Despite its modern heart, the 2010 Vespa lineup still retains the stylish soul of its grandparents. 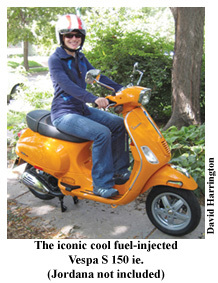 I was giddy when the tangerine orange review Vespa S 150ie arrived. The “S” in the name is a reference to “seventies,” its throwback styling harkens back to the disco era. Normally, I don’t believe we should bring back too much from the 70s, aesthetics-wise, but the Vespa S is a notable exception. While it shares the same general classic Vespa silhouette as the LX-150, the slightly nipped-in front end, rectangular headlight and rearview mirrors set it apart from its more rounded counterparts. Not only do I love the look of the mirrors, the larger size allowed me to capture a lot more of the traffic and obstacles around me. Despite its dashing good looks, I fully expected the S to be a bit of a dog. While both my Buddy and the S share the same engine displacement, the Vespa has a longer wheelbase, taller seat height and weightier metal construction compared to my zippy, plastic Buddy 150. Thanks to a fuel-injected engine, the S made up for its larger size with buttery-smooth and responsive acceleration. I was very pleasantly surprised with the larger Vespa’s handling and overall mechanical performance. Cornering and other fine maneuvers weren’t quite as tight as the smaller Buddy. Braking was excellent and responsive. The monocoque construction of the Vespa allows it to effectively absorb most road chatter, including outsized manhole covers. The physically larger size took a bit of getting used to. While riding, the higher seat was extremely comfortable. I appreciated the slightly higher vantage point on the road. Initially, the reach to the ground at stops felt awkward, but this feeling disappeared rather quickly. A petite person considering the Vespa S should definitely test their fit at a dealership first. The seat itself is incredibly comfortable. It felt designed by Herman Miller. This is a stock Vespa seat, but you’ll think it’s an upgrade. Long commutes would be a pleasure. Adding to the comfort of the scooter is the way the handlebars and controls wrap themselves toward and around the driver. While I don’t find my Buddy at all uncomfortable, the difference was significant. With my Buddy, I sit on the scooter. With the Vespa S, it felt more like I was sitting in the scooter. The S misses the mark with switch layout. While I don’t exactly have the hands of a basketball player, I like that I can effectively cover both the brake and the horn on my Buddy at the same time. The Vespa’s horn was just ever so slightly out of my easy reach. The remaining controls and displays are convenient. The main display has a large and easy-to-read speedometer, a handy clock, a low-fuel warning light, and a comically detailed gas gauge for those of you who find it pressing to discern between 5/16ths of a tank and 7/16ths. The speedometer runs about 10% generous, which is fairly standard across the scooter board. Top speed is approximately 60mph, plenty for most in-city errands and commuting needs, but substantial enough to handle the freeway if you have a devil-may-care attitude about your life. Do yourself a favor and don’t trust the low-fuel gauge. While I didn’t verify its accuracy, I’d rather take 10 seconds to peek in the gas tank than discover it doesn’t work at the most inopportune time. That being said, the rather large tank (2.3 gallons) and generous fuel efficiency (~80mpg) will have you going longer between fill-ups no matter which method you choose. The S has no lockable glove box. Instead, you’ll find an open “pocket” area on the steering column. I could get my garage door opener in one pocket and my small wallet and cell phone crammed into the other. The storage area will not accommodate your morning latté. There is ample under seat storage and a single helmet lock. The bag hook on the steering column accommodated my large workbag nicely, allowing it to rest comfortably and safely between my feet. This gorgeous ride comes in solid red, black or orange as well as blue/white and red/white) with two-tone seats that will make your heart burst with longing. The pros of the Vespa S far outweigh its pithy list of cons. It is easily the smoothest and most comfortable scooter I have driven. All this quality and style has a price With an MSRP around $4,400 the S will cost you a pretty penny on top of just being pretty. In most cases, my practicality would take over and I’d say you’re just paying for the brand name. However, the performance of the S, its armchair-like comfort and its striking good looks build a strong case for being worthy of a splurge.